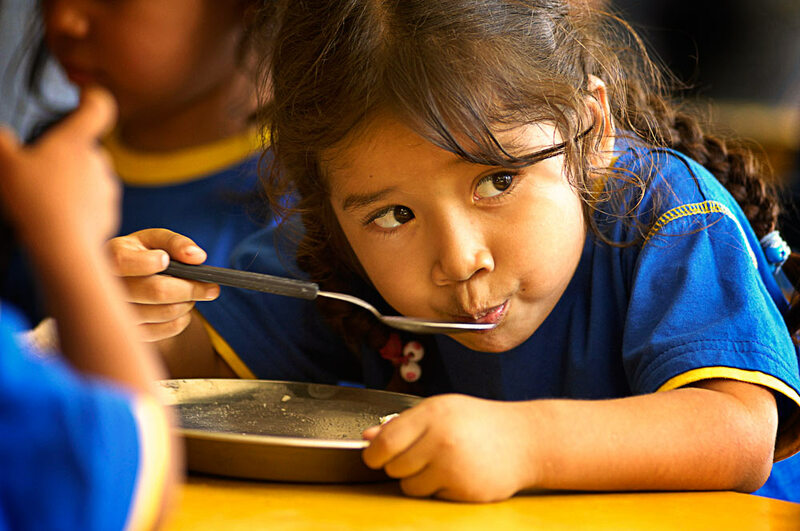 What Food do Children Get from Compassion? We’ve all heard the phrase ‘You are what you eat’. But is good nutrition really that important? We know it is! And the good news for more than 1.6 million children around the developing world is that Compassion helps to meet their nutritional needs. We hear this question pretty often. Naturally, our sponsors want to know how far their money is going. But development isn’t as easily quantifiable as a number of meals per week. The issue of meals and child nutrition is a complicated one, there’s three parts to how we decide the nutritional support registered children receive. The short answer to the question of how many meals children receive is, ‘it depends’. A unique aspect of Compassion’s programs is that they are run in partnership with local churches and implemented by people from the local community. Each church partner has the freedom to contextualise Compassion’s programs in ways that meet the needs of their particular community, while still following Compassion’s general guidelines. We call this ‘freedom within a framework’. The framework—our guideline—is that each church partner provides a meal or nutritious snack for children when they visit the Compassion child development centre. The freedom is that each of our field offices and church partners determine when the centres will meet and what food will be served. For example, in Kenya, six- to eight-year-old children attend the Compassion child development centre for eight hours each Saturday. They are unable to come during the week as they are busy with school and chores and because the distance many of them have to walk makes it impractical for them to come more frequently. These children receive a meal and a snack each Saturday, since they are at the centre for eight hours. A meal will generally consist of rice, beef stew and some green vegetables. A snack might be a cup of porridge or a piece of bread and some fruit. While children in Kenya generally receive one meal and snack a week, six- to eight-year-old children in Bangladesh visit the Compassion centre six days a week—five hours a day from Monday through to Friday and eight hours on Saturday. Schools in Bangladesh don’t generally start until 10:30am, so children go to the Compassion child development centre before and after school. Children spend more hours at the Compassion centres in Bangladesh to combat malnutrition and because the children need extra educational support. 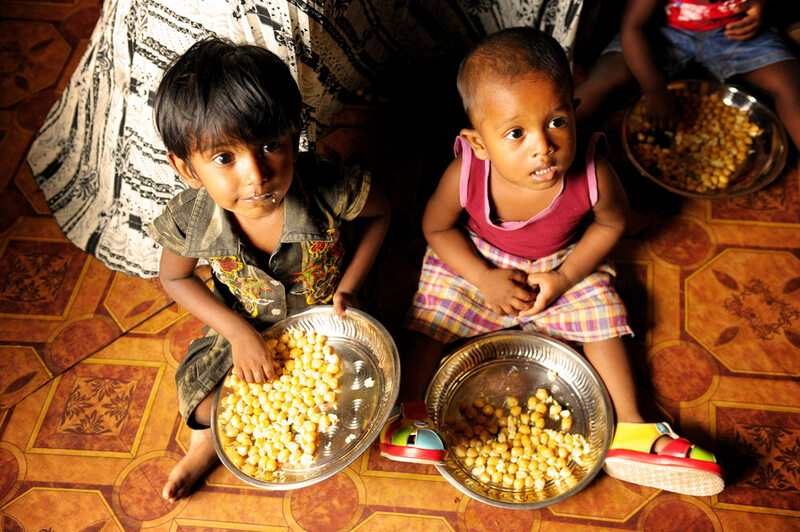 Undernourishment is a big problem in many South Asian countries, including Bangladesh. Nearly half of Bangladeshi children are severely or moderately underweight, and four out of 10 children under the age of five suffer from growth stunting. In light of this, children at Compassion centres in Bangladesh receive a meal (typically lunch) five days a week and fruit and milk once a week. The meals generally consist of rice, lentils, meat and vegetables. While children in Bangladesh receive a meal or snack six times a week, Compassion Ethiopia doesn’t provide meals for children attending the centre as the Ethiopian government strongly discourages non-governmental organisations from distributing food, especially centre-based meal programs. “This is done mainly to minimize an unnecessary dependency syndrome and encourage poor people to consider sustainable ways of securing a livelihood, rather than depending upon someone’s helping hand on a continual basis,” says Dr Fikre Lobago, Compassion Ethiopia’s Program Director. Children attending child development centres in Ethiopia receive a light snack on program days in lieu of a meal, and in some areas, families regularly receive oil and cereal grains as nutritional support. This means that the money previously spent on grains and oil can now be used to purchase fruits and vegetables. In the case that a child is malnourished, that child would receive additional support. We encourage our church partners to tap into local resources to support the children. Often, there are resources available through schools or other governmental and non-governmental organisations to support children nutritionally. We encourage our partners to use these resources so that not only will our support go further, but so the church partners can become more and more equipped to become self-sustaining. Ultimately, Compassion’s programs are focused on helping children become responsible adults who can support themselves. That’s why our programs are about development, not a handout. In more than 60 years of development we’ve found, as have many other non-government organisations, that meal programs often aren’t the best option. We’ve learned that when a program is focused on the physical things the child gets out of it, it’s less successful. Children and parents develop a mindset of dependency, rather than one of empowerment. Today, our programs are developmental. We want to equip children to become adults who are capable of providing for themselves. That happens through focusing on the whole person—their social, cognitive and emotional development—not through simply providing food. We encourage registered children to focus on their development as individuals. This is done through Compassion’s curriculum that helps children learn to build healthy relationships, how to take care of themselves physically, how to provide for themselves long term and, ultimately, how to find true life in Jesus Christ. Another part of helping children and families learn to become self-sufficient is Compassion’s Critical Interventions program. Through these interventions, children can learn vocational skills to enable them to earn a living when they’re older. Families have opportunities to learn how to rear animals or start vegetable or greenhouse gardens. And parents are trained in how to generate income and save for their families’ needs. “Compassion believes that poverty consists not only of the economic aspects of a child’s life, but it is also related to physical, spiritual and socio-emotional aspects of life. Therefore, it is wise to focus on developing the capacity of children and their caregivers to become responsible and self-supporting in addition to supporting them with the immediate basic needs,” says Dr Lobago. Our goal at Compassion isn’t just to support children with their physical needs today, it is to help them become responsible adults who will be able to care for their families long term. But being well nourished is still of vital importance in a child’s life. Compassion International Health Advisor Terry Laura has worked in public health for decades with organisations such as World Vision and Food for the Hungry in countries such as Myanmar, Indonesia and Sudan. Responding to crisis situations, she has seen how malnutrition can damage a child’s long-term wellbeing. That’s why Compassion’s Child Survival Program, which supports pregnant mums and babies from birth to three years old, provides vital nutritional support. The height and weight of the children is monitored every month to detect the first signs of malnutrition and equip mothers to provide for their babies to head off the life-long effects of malnutrition before they start. Children in the Child Sponsorship Program have health checkups once or twice a year and are checked for signs of malnutrition in accordance with the World Health Organisation’s guidelines. If a child is found to be malnourished, we create a plan to respond to that child’s need through Compassion’s Critical Interventions. If the child is severely malnourished, we respond with therapeutic feeding, which may include medical intervention, vitamin supplements and nutritional support. We’ve all seen the pictures of extremely malnourished children in the news. Often times, these extreme cases are due to crisis situations such as war, famine and natural disasters. Because of the preventative care Compassion assisted children have already received, few children within Compassion’s programs are found to be in such a severely malnourished state. More often, children who are found to be malnourished within Compassion’s programs are mildly or moderately malnourished. In these cases, we work with the children’s families to identify the problem’s cause—is it a lack of resources or a lack of knowledge? We also offer vitamin supplements and additional nutritional support based on need and context. We monitor their progress monthly and offer continued support until the child’s health has become stable. Sometimes a crisis situation such as a drought, price hike or a natural disaster will increase a child’s risk of malnutrition. In these cases, Compassion also responds with additional support until the situation is stable. Finally, an important thing to remember is how much Compassion’s workers around the world care about these children, even against hard-to-believe odds. The children’s lives are complicated. Compassion’s staff members are dedicated to doing all they can to help these children long-term. The basis of this blog originally appeared in three posts on Compassion Canada’s blog: part one, part two and part three.